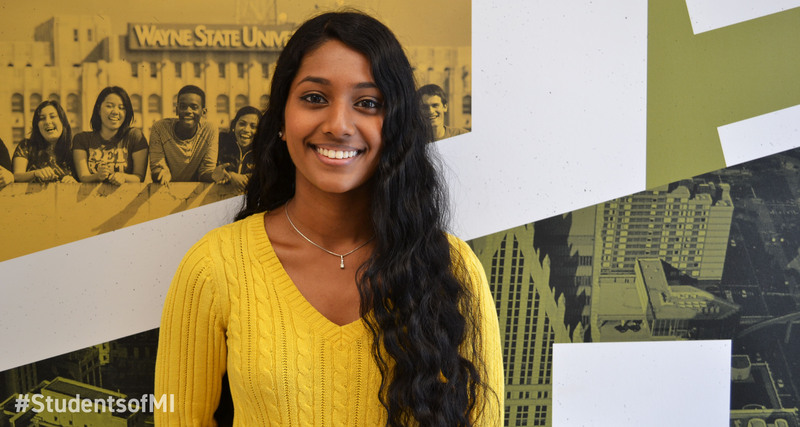 “Wayne State University has always been close to home so it was a really easy decision to come here. The student body here is extremely diverse in a way that I would not have been able to imagine as a student in high school. Having people who come from various backgrounds and who are pursuing various career paths has really allowed me to cultivate an open mind to the fields of study that I could pursue at Wayne State University and beyond. The wealth of knowledge is also beyond inspiring here. You hear about events, research, and so much more from your friends and community of peers, and I get excited when I realize that so many opportunities exist at Wayne State – not just as a student but as an individual. I’m on the premedical track and I aspire to go to medical school. I’ve wanted to be a doctor since I was 11 years old, so I always knew I would be on this track and that college would be in the books for me. I chose to major in psychology after taking psychology courses in high school, and I love Spanish and learning about Latin American cultures. Fitting in a Spanish minor was relatively simple to think about, and the honors college followed into my academic plans because of their financial support – it’s been awesome to have that. The only thing I added later on was my Certificate in Entrepreneurship and Innovation. As I gained interest in Detroit’s entrepreneurial ecosystem, I became more interested in gaining an academic understanding of entrepreneurship, which is why I added that additional program on last year. The leadership at Wayne State is open minded and attentive to students’ voices, and I’m very appreciative of that. The community is open to students taking on leadership positions and creating opportunities for themselves. I was able to do that when I created an organization called OptimizeWayne, which actually is what got me interested in entrepreneurship. OptimizeWayne empowers students who have ideas for social impact startups, and that’s gained a lot of support from the administration and leadership on campus. We’ve been able to empower a lot of students who form communities to create positive social change in the city. That’s been one of the most gratifying experiences at Wayne State, and it wouldn’t have been possible if it weren’t for the supportive foundation that exists here.